An Indian military plane with more than 20 people on board has gone missing over the Bay of Bengal, the Indian air force (IAF) has confirmed to the BBC. The Antonov-32 transporter aircraft took off from Chennai (Madras) at 08:30 local time (03:00 GMT), bound for Port Blair in the eastern archipelago of Andaman and Nicobar. It was scheduled to land at 11:30. Four aircraft and twelve ships have been deployed to search for the missing plane, the ministry of defence said. The IAF operates more than 100 Antonov-32 aircraft. A navy spokesman told the Reuters news agency that surveillance planes and ships were looking for the missing aircraft, which was carrying service personnel to strategic islands near the Malacca Straits, where India has a military base. 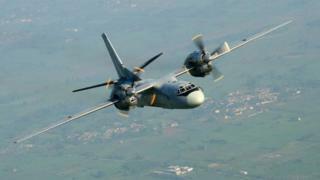 India’s ministry of defence initially deployed two airplanes and four ships to look for the missing aircraft. Eight more warships have now joined the search.